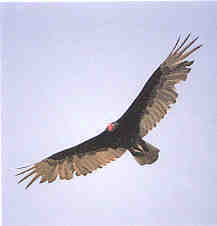 The last few days have been windy enough for the turkey vultures to soar about just drifting on the wind. Although, I'm usually repulsed by this ugly bird especially when I see it feasting on road kill, it's really beautiful to watch it soaring overhead. They can soar for hours without even flapping their wings. Amazing. Even my dogs watch the vultures as they dip closer and closer to the ground. I'm sure me and my dogs are a comical sight just standing and watching with eyes to the sky.